What is better than a slice of moist and delicious almond cake with a cup of tea when you are looking through the windows and only see a white and grey sky? I don’t know about you, but I tend to have sweet cravings when I get into fall and winter type of weather. I brought mirabelle from France, it’s a hard liquor made with mirabelle fruits, they’re a kind of small and yellow plum that supposedly only grow in Lorraine region (where I grew up), don’t tell any Lorrains (people from Lorraine), but I have seen them in other parts of France too, I think they grow in iron-rich soil. Lorraine is famous for its mirabelles, and we pick them in late August or fall. They’re delicious in tarts, like tarte à la mirabelle which is a local specialty. My parents have a huge garden with a bunch of mirabelliers (mirabelle tree) and they produce a lot of those pretty and sweet plums, so every year my dad, picks them and gives them to a friend who has the license to distill the alcohol…and here we go, he produces a lot of liters of mirabelle (I know he has over 100 bottles in his cellar). Every year when I go home, I bring back a few bottles which always remind me of home when I have a “coup de blues” (homesick). 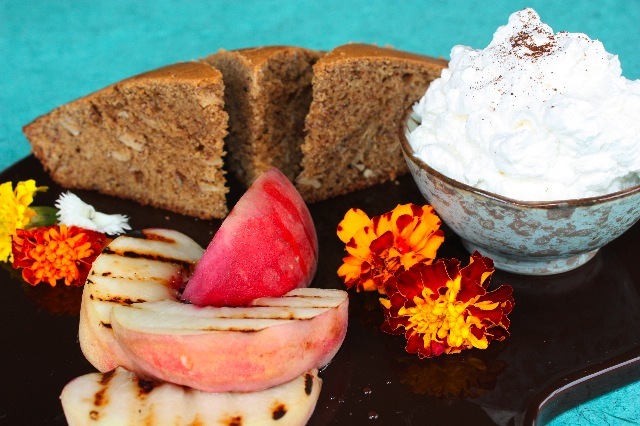 The liquor is very flavorful and fruity, and I use it when I bake cakes like this one, it goes wonderfully with almond flavor, or if you have a tough mouth, you can sip some of it after a meal, it’s great for digestion. In my case, I can hardly drink it, it’s too strong. I have seen mirabelle at “Beverages and More” if you are interested. I used palm sugar that is a healthy alternative to sweetener, it has a lower glycemic index than other sugars and only have 20 calories per 2 tsp. Palm sugar is produced from nectar of coconut palm trees, and it has a wonderful raw and nutty flavor. Mix eggs and almond meal. Add sugar and mix well. Add oil or butter and mix to get a smooth consistency batter. Add flours, almond extract, vanilla powder, mirabelle liquor. At the end, add baking powder and baking soda. Bake in a pre heated oven at 370F for about 30-40 minutes. Let it cool before serving. 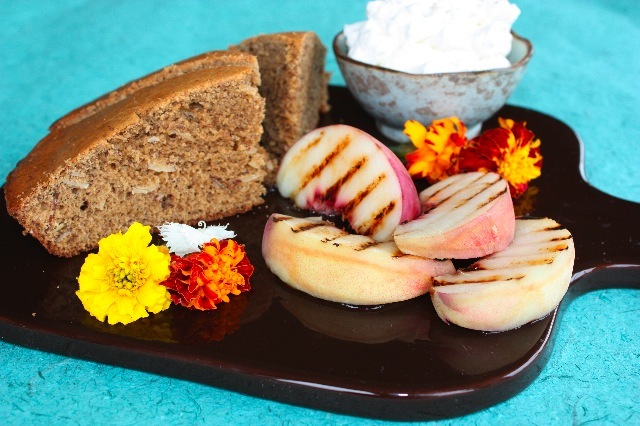 Cut white peaches in 6 quarters, and grill each side on a grill pan. Whip heavy cream, adding some vanilla powder and a little sugar. Serve with a slice of cake, a few slices of peaches drizzled with honey or agave nectar, and serve with whipped cream on the side. This entry was posted by silvia on July 22, 2009 at 5:53 pm, and is filed under Desserts. Follow any responses to this post through RSS 2.0.You can leave a response or trackback from your own site. Ca à l’air vraiment délicieux. J’aime bien ton blog. Almond is nice. Thank you for sharing. Cheers !